The latest UN IPCC report makes it crystal clear that carbon dioxide (CO2) is not the only pollutant that matters for limiting future warming. Deep reductions in emissions of non-CO2 pollutants, particularly methane (CH4), are essential to staying below temperature targets, and have the added benefits of improving public health, food security, and ecosystems. 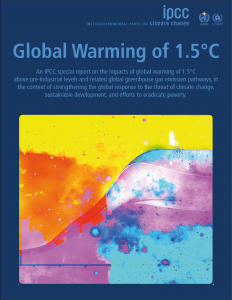 Further, the new report highlights robust evidence that limiting warming to 1.5 °C above preindustrial levels, rather than 2 °C, greatly reduces risks of water stress, extreme events, sea level rise, and more. For example, risks of allowing temperatures to rise to 2 °C include several hundred million more people susceptible to poverty, ten million more people threatened by sea level rise, fifty percent more people under water stress, and 1.5 million metric tons of loss in annual fisheries catch. The report stresses that we are running out of time, with only about ten years to get a handle on greenhouse gas emissions if we’re going to stay within 1.5 °C degrees. The benefits of staying below 1.5 °C are powerful and plentiful, and reductions in short-lived climate pollutants, especially methane, are key to achieving this goal. Overshooting 1.5 °C will have negative consequences to human and natural systems, such as potentially irreversible impacts to coral reefs. An overshoot also increases our dependence on carbon dioxide removal mechanisms, possibly to an extent that is not technologically possible as of now. Pathways to limit warming to 1.5 °C include reducing human-caused methane emissions by thirty five percent or more by 2050 relative to 2010 levels. Methane is responsible for around a quarter of today’s warming, for three reasons: it is more potent at trapping heat than carbon dioxide pound for pound; it produces another potent greenhouse gas, ozone, when it oxidizes in the atmosphere; and we emit around a million metric tons of methane into the atmosphere from human activities every day. Further, methane impacts the climate in fundamentally different ways than carbon dioxide, because the two greenhouse gases have vastly different atmospheric lifetimes. CO2 can last for centuries in the atmosphere, building up over time and committing our planet to warming for generations to come. On the other hand, methane only lasts for around a decade, packing an intense warming punch for only a short period of time. So we can think of it as CO2 controlling how hot the planet ultimately gets, and methane controlling how fast we get there. While it is therefore essential to decarbonize society to stabilize long-term temperatures, methane reductions can have a near-immediate impact on cooling the planet because it is so rapidly removed from the atmosphere. This can limit warming during our lifetimes, and is an important and necessary complement to simultaneous reductions in CO2. There are three main sources of methane emissions from human activities: energy use, agricultural activities, and waste management. The current technological feasibility and cost effectiveness of reducing emissions from each of these sources varies considerably. However, there is one sector that has proven technologies at little cost to reduce a large fraction of methane emissions: oil and gas. Oil and gas operations are the largest industrial source of methane. Estimates of abatement potentials show that we could reduce global emissions by 45% below 2012 levels for little cost, and we have the technology available to reduce emissions by 75% below 2012 levels. While global oil and gas operations are currently reported as being responsible for around a fifth of today’s human-caused methane emissions, new research suggests that emissions have been low-balled; in the U.S., emissions have been found to be 60% higher than previously reported. Although decarbonization of our global oil and gas system will ultimately reduce a majority of methane emissions from this sector, transitioning away from fossil fuels including natural gas and oil will take quite some time. On the other hand, these opportunities to reduce methane emissions from oil and gas activities are available now, many of them are easy to implement, and the benefits would be near-immediate. With no time to waste, methane reductions are urgently needed to stay within 1.5 °C of warming. Overall, oil and gas methane reductions are the fastest, cheapest actions we can take to slow the rate of climate change. This entry was posted in Climate, Methane, Natural Gas. Bookmark the permalink. Both comments and trackbacks are currently closed.